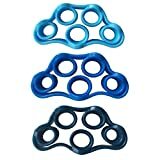 Made of high-quality, flexible silicone, to ensure optimal exercise results. Ideal for injury rehabilitation or prevention of arthritis, carpal tunnel syndrome or tendonitis and joint pain. By uisng the silicon finger bands, you can not only stretch the muscles in your palms and wrists but also strengthen the individual fingers. Finger Trainer was specifically designed to exercise & strengthen your expanding muscles, balancing all of that over-gripping.